Xenophon was later exiled from Athens, most likely because he fought under the Spartan king Agesilaus II against Athens at Coronea during the Corinthian War (Wikipedia). Next day he crossed the mountains of Achaea Phthiotis, and for the future continued his march through friendly territory until he reached the confines of Boeotia. Here, at the entrance of that territory, the sun seemed to appear in a crescent shape, and the news reached him of the defeat of the Lacedaemonians in a naval engagement, and the death of the admiral Peisander. Agesilaus now marched through the pass of Thermopylae, traversed Phocis, which was friendly to Sparta, entered Boeotia, and encamped near Chaeroneia. Here a partial eclipse of the sun occurred, and at the same time news came to him of the death of Peisander, who was defeated in a naval battle off Cnidus by Pharnabazus and Conon. The solar eclipse appeared directly before the battle at Coronea. Spartan king Agesilaus II had been in Asia Minor to assist Greek settlements against the Persians. Early in springtime, he was organizing troops in the vicinity of Thebe for a campaign to the Asia Minor inland, when he was recalled to Greece for a war between Sparta and Athens with allied. He left part of the troops with a governor in Asia Minor, and rapidly marched with the rest via the Hellespont, Trace, Macedonia and Thessaly towards Boeotia. Underway he got both good and bad news about already ongoing acts of war. The year of the battle at Coronea is given as the second year of the 96th Olympiad, and thus RomBC 395/4 (-394/3) in our chronology. We are looking for an observable partial solar eclipse (magnitude >0.5) in the late afternoon and visible at Chaeroneia. In the late afternoon, because the reports say that it was visible when the troops were already encamped after a long day's march. Stephenson considers the annular solar eclipse of -393 August 14 as a candidate (ref.4). 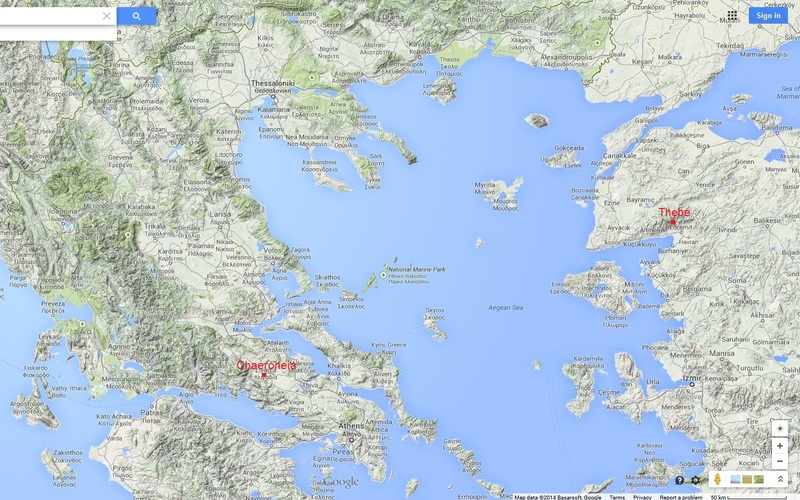 That eclipse had the magnitude 0.91 at Chaeroneia, but it was a morning event and it was over before noon. The discrepancy regarding the time of observation is noted by Stephenson: "Although the Sun would be high in the sky at the time, Agesilaus would be marching in a south-easterly direction, facing into the Sun, so that the eclipse would be more easily noticeable." But there is actually another objection against this eclipse: it happened in August. Did it really take about six months to march the about 1000 kilometers from Thebe to Chaeroneia? Remember that Agesilaus had not yet begun his campaign against the Persians when he was required to set off for Greece ("the season verged on spring", ref.1). Paul Cartledge (ref.5) mentions that an army with infantry and impedimenta would have needed three months to move about 3000 kilometers at the time of Alexander the Great. About 500 kilometers could be covered in twelve days if forced march was required. Within the period -500 to -100 there are 17 partial solar eclipse in the late afternoon visible at Chaeroneia (ref.3). If we redate the second year of the 96th Olympiad according to our hypothesis 232 years towards our time, we arrive at -162/1. Among our 17 candidates we then find the solar eclipse of -162 March 15. The magnitude was 0.76 and it started at about 5 o'clock in the afternoon, with the maximum one hour later when the Sun was five degrees above the horizon. The crescent shape must have been clearly observable with the naked eye. If we are right, this seems to have been a "real" eclipse immediately before a determining battle. Agesilaus was aware that this portent together with the news about the defeat of the Spartan fleet would lower his troops' will to fight and therefore suppressed the news. Maybe the eclipse was a "model" for the later Roman custom to garnish important accidents with portents like eclipses, volcano eruptions, earthquakes or all together at the same time? Greek history was synchronized with Roman history long time before the introduction of the Christian era, see e.g. Diodorus Siculus. The Olympiad dating was in use from the 4th century BC until the 3rd or 4th century AD, Roman Emperor Theodosius I outlawed the Olympic games as pagan in 394. However, Christian chroniclers continued to use the Olympiad count as a way of synchronizing biblical events with Greek and Roman history. 5. Cartledge, P.: Alexander the Great: The Hunt for a New Past, Pan Macmillan 2004.